Gather round with your besties and enjoy these classic flicks. There’s nothing quite like getting together with your friends for a movie night. 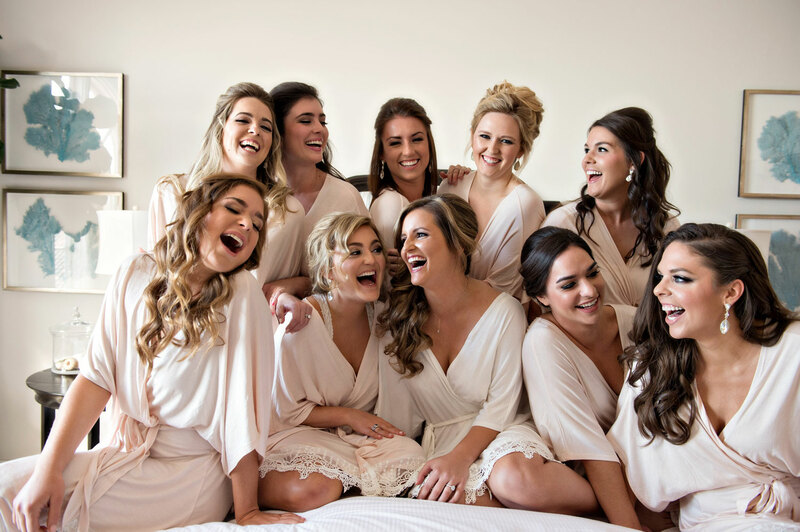 It also happens to be a great way to bond with your bridesmaids before the wedding. If you’re not a big partier or just need a relaxing night during a crazy bachelorette weekend, an old-fashioned slumber party is a classic good time. Or maybe you just need a distraction the night before the wedding and want to enjoy your last hours of unmarried life with your favorite ladies. You can even gift them monogrammed pajamas for the occasion! If your bridesmaids offer to help with a DIY project or to stuff envelopes with invitations, a movie marathon can help to pass the time. So order some pizza and grab the popcorn, because we have movie options for just about every mood to watch with your bridesmaids! Bridesmaids - Maybe avoid if there have been tensions between your bridal party, but otherwise it’s a great way to laugh through any problems your wedding might encounter. Father of the Bride - Both the 1991 remake and 1950 original are classics that are guaranteed crowd pleasers. My Big Fat Greek Wedding - If you have a huge family, you’ll be reminded that despite any craziness, your nuptials will be filled with love. The Notebook - Make sure you have the tissues handy if you have any criers in the group. When Harry Met Sally - The ultimate romantic comedy – especially if you and your beloved started as friends. Say Anything - Be warned, you may want to change your first dance to “In Your Eyes” after watching this movie. Crazy, Stupid, Love - Not only is Ryan Gosling frequently in suits in the film, but he also appears shirtless. Plus Emma Stone and Julianne Moore will have you wishing to be a red head. It's a feel-good movie that's both funny and sweet. 300: Rise of an Empire - Who needs a plot? Throw this one on mute and catch up on some gossip. Magic Mike XXL - No explanation necessary. Pitch Perfect - There's even a sing-a-long version so you and your friends can join in on the fun! Grease ­­- It's guaranteed that at least one person in the bridal party was in a school production of the musical. There will be stories. Moulin Rouge - The film is a tragedy, but the interpretations of contemporary songs are showstoppers. The Princess Diaries - All the film’s one-liners will come back to you as you watch Anne Hathaway’s breakout role. Now and Then - The ultimate sleepover film with a star-studded cast tells the tale of four childhood friends who reunite in their hometown and reminisce on an important summer. You probably watched this movie with one of your bridesmaids as adolescents. Dirty Dancing - An 80s movie that takes place in the 60s, it’s hard not to be more nostalgic than this Patrick Swayze film. The soundtrack will be stuck in your head for weeks after. Discover the best movies to watch for wedding inspiration and consider these songs from wedding-themed movies for your nuptials!